Cowboy Chex has sired many great sons, you have Cowboy Up Chex, Cowboy Tuff Chex, Cowboy Casanova and the list keeps going. 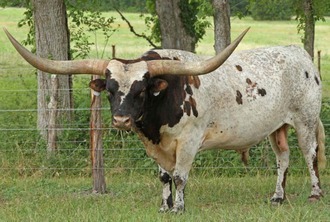 Deer Creek Longhorns is breeding him to a lot of nice animals and are getting great results. Cowboy Chex is truly one of the top bulls in the industry and is leaving his mark.